Participate in multiple events with numerous divisions for color belt and black belt competitors. Download the event packet TODAY AND REGISTER! View on-line event rules here. 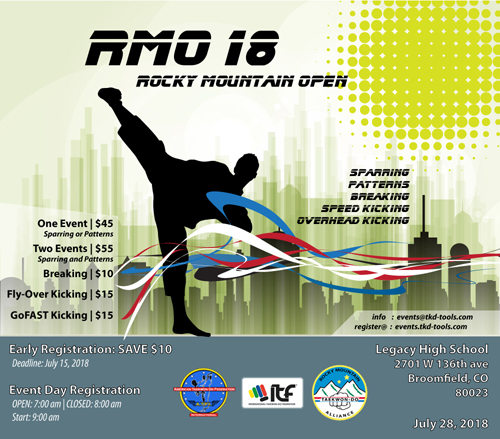 You are cordially invited to attend the 2017 Rocky Mountain Open on July 28, 2018 at Legacy High School in Broomfield, Colorado. The Rocky Mountain Taekwon-Do Alliance, in association with Trinity Taekwon-Do, is excited to host this martial arts experience and welcomes your participation. Make your plans today to attend this Martial Art event. Competition Events - "A Little Fun for Everyone"
We excited to present you with this opportunity and look forward to your attendance. The Rocky Mountain Taekwon-Do Alliance (RMTA) provides an open framework and collaborative environment that enables it’s registered and affiliate members to contribute across all aspects of Taekwon-Do practice and growth. Standards-based Taekwon-Do instruction, guidance, certification and mentoring for its members are core fundamentals within the RMTA. Taekwon-Do students, instructors and schools who actively study and promote traditional ITF-style Taekwon-Do can readily join to immediately benefit from this structured organization. How is the RMTA Different? While most organizations enforce membership with costly fees that "roll up" from the individual instructors, the RMTA offers a contrasting "alliance" that enables those instructors and schools to maintain control of their own destiny. Instructors and school owners have the opportunity to receive enhanced services of the organization through our business focused tools, organized certification programs and events. The Alliance extends control and power to individual instructors and school owners to retain the fruits of their labor. Alliance members are afforded membership options that deliver standards-based requirements for certification and on-line instructional aides. The combination of these tools and membership benefits enable growth and knowledge across all aspects of Taekwon-Do training for white belts through black belts. The Alliance extends additional organizational services to its members to enable member and school growth as well through cost effective marketing solutions and services. The guiding principle of the RMTA is that “Membership has its Privileges”. 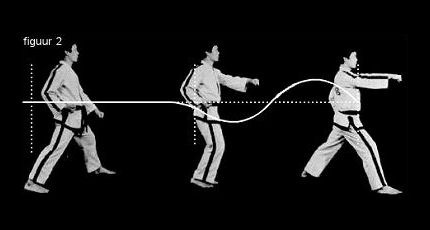 The Sine Wave (sinewave) motion and the variation of sine wave in Taekwon-Do movement unique to ITF Chang Hon-style Taekwon-Do. Sine wave motions varies within the patterns to define movements as: (1) Normal; (2) Fast; (3) Continuous; (4) Connecting and; (5) Slow. This article provides guidance on these differing motions in ITF Taekwon-Do patterns.